JHARSUGUDA: A special Pallisabha was conducted to acquire 9.6 acre of forest land for extension of Jharsuguda air strip at Talmal village under Dur langa panchayat of Jharsuguda block on Tuesday. Jharsuguda BDO TR Majhi conducted the Pallisabha while Ward member Fakir Mohan Kishan presided. The Airports Authority of India (AAI) wants the additional land for the runways and construction of another terminal building to cater to the increase in number of passengers. Hundreds of villagers, who attended the Pallisabha, voluntarily favoured transfer of the land for the proposed extension of the air strip. On the other hand, they demanded appointment of the villagers in AAI as per their qualifications and payment of compensation to the occupants of the Government land. 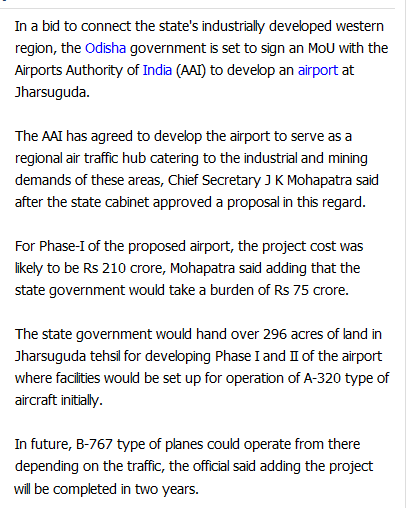 Jharsuguda Tehsildar Bhawesh Naik said the airport used during the World War II requires 118.65 acre of land in Talmal, Durlaga and Malimunda villages of which 56.12 acre is private land and rest 66.63 acre belongs to the Government. Even as onion price has started to shoot up, farmers in western Odisha — especially in Bolangir, Kalahandi and Nuapada districts — are rueing for missing out a chance for reaping profits. Majority of farmers in the region have either sold their stocks to middlemen or disposed of produces in open market at a price very low by any market standard. The price of onion at farmers’ level had varied between Rs. 3 and Rs 9 per kg. The reason for this situation is absence of storage facilities and farmers’ cooperatives. Moreover, farmers have no access to bigger market from where they could get fair price of their produces. The prevailing poverty level in the region is also adding to the woes. As soon as their crop is ready for harvest, farmers sell it either in the open market or to middlemen at whatever price offered to them. Odisha produced 432,052 metric tonnes of onion in 2013-14. Bolangir alone had production of 123,006 mt accounting for more than 28 per cent of State’s production. Similarly, Kalahandi and Nuapada districts had produced 31,888 mt and 11,414 mt respectively. While the highest onion productivity was found to be 14.74 mt per hactre in Bolangir, the productivity in Kalahandi and Khariar is 13.32 mt and 13.46 mt per hactre respectively. Only Angul district with 13.55 mt per hectare of productivity matches with these three western Odisha districts. “I had taken up onion cultivation in two acres of land. Although the production was below my expectations after being affected by three days of unseasonal rain during May, my profit margin could have been more in view of rapidly rising onion price in the market. But we hardly have any storage facility to preserve our produce,” Ram Narayan Singh, a farmer in Khariar block of Nuapada district, said. He said unless farmers’ cooperative is not developed with government back-up in the region, farmers would continue to fall victim to distress sale. The region, known as Odisha’s Nasik, could keep volatile price of onion in check if basic infrastructure facilities and services are provided to farmers. The government of India declared Odia as the sixth classical language of the country on February 20, 2014. On that day, Odias across the state found an occasion to rejoice. 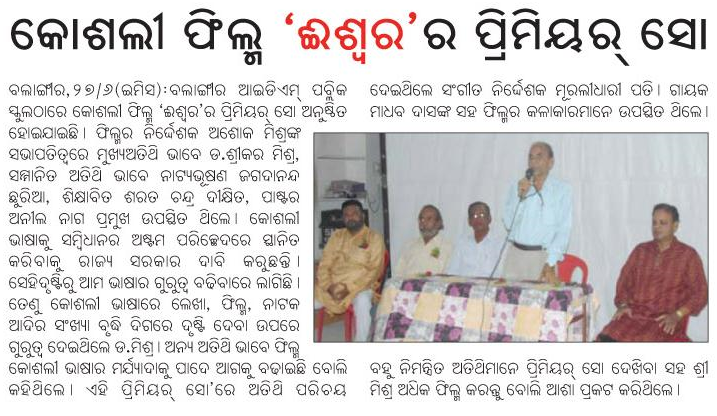 Linguist Debiprasanna Pattanayak had explained the classical characteristics of Odia before the language experts of our country on July 23, 2013, which led to the decision. On March 1, chief minister Naveen Patnaik wrote a letter to the Union home ministry recommending Sambalpuri/Koshali and Ho languages to be included in the Eighth Schedule of our Constitution. It was perhaps the first step that the people of west Odisha wanted for their mother tongue to achieve. But ever since, reputed linguists seem to have fears that if a language goes to the Eighth Schedule, it might give the people speaking it reasons for a statehood demand. Some gave the example of Konkani language leading to formation of Goa. They are afraid that the state of Koshal might come to existence if Sambalpuri/Koshali goes to the Eighth Schedule. But, what about Ho? Are we going to deprive the right of a people, the rightful place of its mother tongue? What languages were fillips in the formation of the states of Jharkhand, Chhattisgarh, Uttaranchal and Telangana? We know that economic issues are more important than language and culture for formation of states. Therefore, linguists must not invite disrespect from the people by opposing the rightful place of its mother tongue. When George Abraham Grierson started his Linguistic Survey of India in 1894, the people of west Odisha had been speaking Sambalpuri/Koshali. They understood the Odia Bhagabat better than Hindi (Awadhi) Ramcharit Manas. Therefore, when the chief commissioner of Central Provinces, in his order dated January 15th, 1895, abolished Odia as the court language of Sambalpur and introduced Hindi in its place, people had to fight against that. “The language agitation started in Sambalpur and became widespread in Orissa. 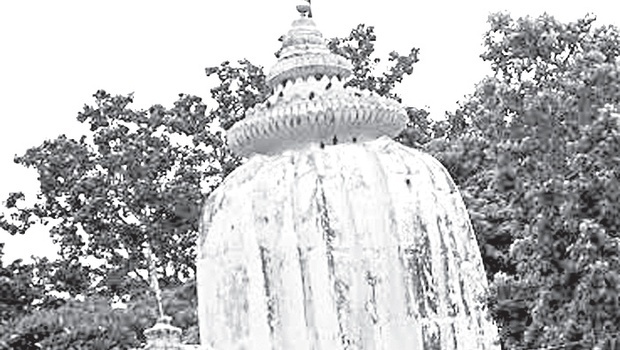 Oriya was restored as the official language of Sambalpur in 1903 and subsequently in October, 1905, the bulk of the district was transferred to Orissa,” reported the writers of Orissa District Gazetteers, Sambalpur, in 1971. All India Radio, Sambalpur, started working in 1963. By then, known writers of Samalpuri/Koshali were Kapil Mahapatra, Balaji Meher, Laxmana Pati, Khageswar Seth, Shashi Bhusan Mishrasharma, Motilal Panda, Satyanarayan Bohidar and Bidhu Bhusan Guru. The Renaissance of Samalpuri/Koshali language and literature began in 1984. We got Rangabati (song) of Mitrabhanu Gountia, Sasemira (drama) of Prasanna Sahu, Bhukha (drama/film) of Manglu Biswal and Ukhi (drama) of Binod Pasayat. We got hundreds of songs and lyrical plays from AlR, Sambalpur. West Odisha experienced something wonderful and encouraging in Haldhar Nag. From 1990, he has been carrying with him Sambalpuri/Koshali poems to national centres of education and culture throughout the country. Sasemira was awarded the first prize in National Drama Festival, Allahabad in 1983. Since then, Sambalpuri/ Koshali plays have been successfully presented at various cultural centres across the country. The Sambalpuri/Koshali Drama Competition, held in Sambalpur every winter, has been presenting plays of good quality for the last 17 years. Among the new generation of Sambalpuri/Koshali playwrights, Panchanan Mishra, Brajendra Nayak, Kesaranjan Pradhan, Ashok Bohidar, Nakula Badi and Arun Sahu are some of the well-known successful playwrights. At present, we find epics of the Ramayan, the Mahabharat and the Bhagabat, recreated by devoted poets such as Ujalbati, Nilmadhab Panigrahi, Hemachandra Acharya and Purnachandra Sahu. We find books on stories, novels, grammar and dictionary and almost all kinds of literature in Sambalpuri/Koshali. Some 30 magazines have been enlisted in the language. Why is this enumeration here? Questions have been raised if the state government would consider the demands when forwarded a proposal to include the Berhampuri dialect in the Eighth Schedule or if the people of Balasore or Baripada demand separate language group status in future. Well, why not? If those spoken forms in course of time acquire the characteristics of a natural language as we find today with Sambalpuri/Koshali, we should be happy with that if it happens. Linguist Debi Prasanna Pattanayak had said: “Issues over relationships between the languages and dialects always have problems and it is a pan-world phenomenon.” But then, can a linguist decide between language and dialect? At best, linguists study them and give a theory. The decision will be taken by the people and their government. Therefore, the steps taken by the state government for the rightful demand of the people of west Odisha for their mother tongue do not show “immature political statesmanship and vision”. They reflect the wisdom and maturity of a good government. Languages acquiring dialects and dialects becoming languages go together. Till there are Hindi films, the language will go on prospering, acquiring strength from all the languages of the globe. 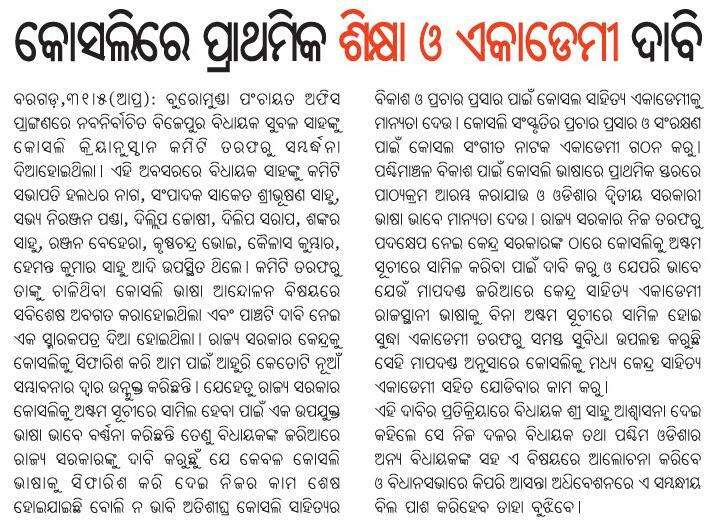 If linguists believe, as some have expressed, that the people of Balangir are not supporting the idea, they may contact Kosali Ekata Manch of Sonepur and Kosal Kranti Dal of Balangir to get disillusioned. Gangadhar sang: “If you want to be respected /Have utmost respect for your mother tongue.” Though this couplet generating self-respect was sung for Odia while she was in danger, it is applicable to every language and its speakers. Therefore, the newspaper advertisement of the state government respecting a mother tongue should not be assumed as “dangerous”. In 1895, people had hesitation to proclaim Sambalpuri as their mother tongue, whereas in 1995, they shouted with joy that Sambalpuri/Koshali is their beloved mother tongue. The language had already acquired the excellence and the power of expression for which one will be proud of using that. As a resident of Odisha, everyone should rejoice to find the achievements of Sambalpuri/Koshali.